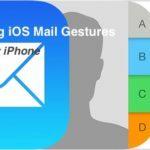 Every iOS device since the launch of the original iPhone has included Apple’s Mail app, the stock tool to pull and manage your email on your devices. 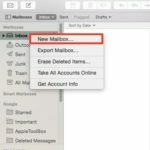 Apple’s Mail app was one of the original standout features of the iPhone, having already been an established service on the Mac, and being significantly more practical than any other phone email app at the time. Since 2007, however, the Mail app has began to fall behind. It no longer receives active push-notifications for popular services like Gmail, its Apple Watch app is amongst the worst for the device, and it has failed to keep up with newer designs and features found in other apps. 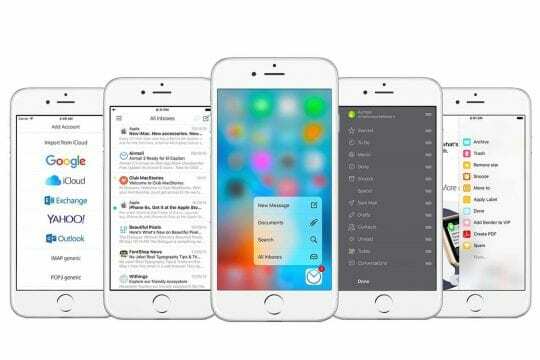 Now that iOS 10 allows us the ability to delete stock Apple apps and replace it with third party apps, you may want to evaluate the better alternatives out there that will provide you the best e-mail and calendar management applications. I, personally, stopped using the Mail app when a third-party client called Mailbox launched in 2013. 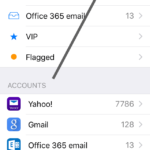 It not only had a better design than the stock Apple app, but also had a new concept for managing email that is now standard in most phone email apps, including Apple’s: swiping to the left or right of messages to send to archives, delete, schedule a reminder, or categorize. It was really an amazing app. Unfortunately, Dropbox acquired Mailbox and in December chose to shut it down. Since then, I’ve been looking for the perfect replacement app, and so far, I’ve found three apps that are certainly worth looking into if you have an iOS device. Inbox is definitely worth giving a good look if you have a Gmail. 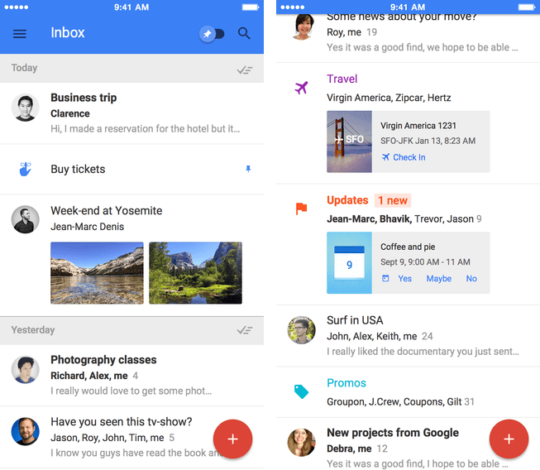 The app uses Google’s Material Design language to present email in a bright, beautiful, simple layout that makes its easy to read and sort through. When you launch the app, you’ll be shown a curated list of email, not by date, but by importance. Sometimes you’ll see one important email, while other times you’ll see a category of emails you may have some news in, like Purchases or Promos. Inbox will require you to trust it to organize your mail how it thinks is best. There’s no option to get a chronological view, which was a deal breaker for me, but if you’re someone who only gets a few emails a day, your probably better off with Inbox. 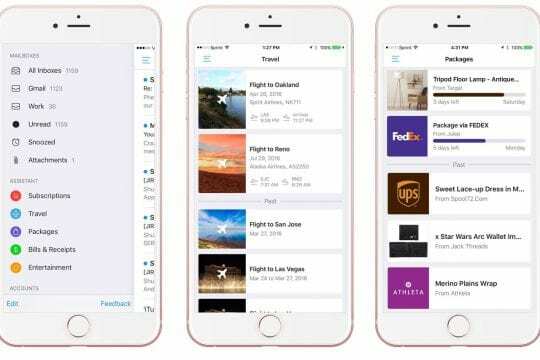 Similar to Mailbox, Inbox allows you to swipe on Messages to categorize them and make reminders, after which you can access them via a menu in the app. As mentioned before, Inbox intelligently categorizes your email into separate categories, and you can sort between them. Inbox is completely free and is available on the iOS App Store here. AirMail is sort of a best-of-all-worlds email client for iOS. It features all the basic things you’d expect from using the regular Mail app, like 3D Touch actions on the icon and within the app, as well as support for multiple inboxes from any service. AirMail is also probably the closest you’ll get to Mailbox today on iOS. Swiping to the left give you the option to trash the message and a list of other actions, while swiping to the right give you the option to snooze or archive the message. The apps unified inbox is fantastic, and you can easily switch between inboxes at any time or even while writing messages. 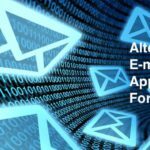 The apps Settings are incredibly detailed and feature rich, and allow you to do a number of things other email apps don’t. It’s also worth mentioning that AirMail probably has the best Apple Watch mail app out there, which lets you do mostly everything you could on the phone, except reasonably tailored to the watches screen. AirMail is available for $4.99 on the iOS App Store here. Email is certainly an interesting one. It’s completely free, and has all of the features you’d expect from the stock Mail app, including 3D Touch actions. It has support for multiple accounts and even has the swipe actions first introduced in Mailbox. What makes Email special is its ‘Assistant’ feature. This feature, which can be accessed by the menu on the left of your inbox, will automatically organize email that fits into one of five categories – Subscription, Travel, Packages, Bills and Receipts, and Entertainment – and put everything all in one place. While the organization is nice, Email takes it even further. If you go into Subscriptions, for example, you’ll be greeted with a list of every service you are subscribed to that sends you emails, each with two options: Favorite, or Unsubscribe. Favoriting one will add it to the favorites menu, allowing you to easily read content from the subscription. Unsubscribe will instantly go in the background and unsubscribe you from the service, all by pushing a button. In Packages, you’ll be greeted with a list of packages, starting with things already shipped and then a list of past packages. The things still in shipment have a bar showing how much time is left for your packages, and when you should expect it. Clicking on it will bring you to a tracking page. Travel will give you a list of travel accommodations you’ve made and easy access. While Email may not be the most beautiful or feature packed client, it has everything you’d need to get email done, along with the unprecedented assistant feature. Email is available for free on the iOS App Store here. As someone who has multiple email addresses and gets somewhere around 200 emails a day, AirMail has become my default client. They have a Mac client that syncs with iOS, making it easy for me to categorize and manage email. If you’re not an email power user, and you have Gmail, try out Inbox. It’s definitely not for everyone, but if you like how it categorizes your email it will make email a dream. If you don’t fall into the other two categories, I’d highly recommend you go and try Email right now. It is probably the best free third-party email client on iOS, and there’s no risk in giving it a try. Learn about some of the other exciting features of iOS 10 that are available to you. 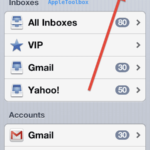 What are some of your favorite e-mail apps that you regularly use on your iPhone and iPad? I was surprised not to see SPARK on this list. That is supposed to be the big game changer in the e-mail field.